Earth Month may be coming to a close—but here at Target, sustainability is something we incorporate throughout our business every day. We’ve long been interested in designing and operating energy-efficient and sustainable buildings, and finding new ways to meet some of our energy needs with solar power. In fact, we’re working towards a goal to have 500 buildingswith rooftop solar panels by 2020, and are well on our way with over 350 complete projects. Why go big with solar? 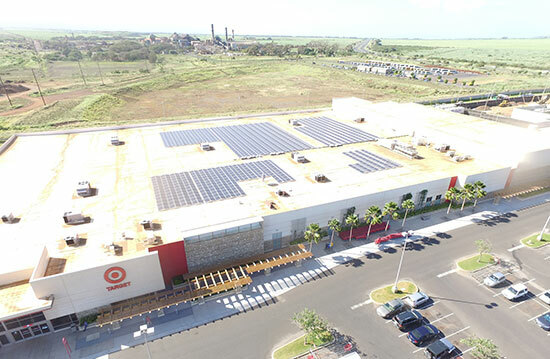 At Target, we strive to lead the way in sustainable operations and recognize that meeting our energy needs through solar is good for the community and environment. It also helps us reduce our energy cost—a rooftop solar project will generate enough energy to offset between 15 and 40 percent of a property’s energy needs. Last year, in partnership with our solar vendors, we added more than 75 megawatts of solar across our stores. This is equivalent to powering over 12,400 homes in America, and more than any other U.S. retailer. We currently have solar installations up and running at buildings in 20 states across the U.S., from California to Massachusetts to Texas, and even Target’s home state of Minnesota. It’s just one reason we were named Environmental Protection Agency’s ENERGY STAR Partner of the Year for the second year in a row, and the Solar Energy Industries Association’s 2016 top corporate solar installerin the U.S.
Arizona is one of the sunniest states, making it a bullseye for Target solar projects. We’ve installed 13 rooftop projects here, totaling 7 megawatts, and are working to install an additional 10 or more in 2017. 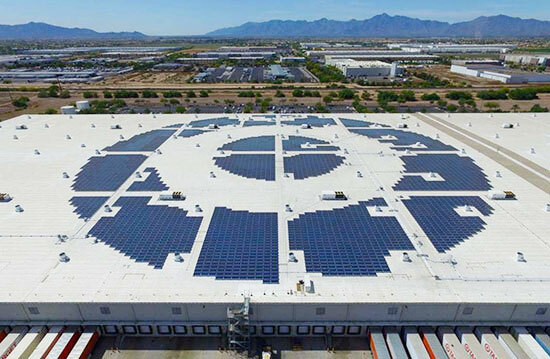 We just unveiled Target’s largest completed solar array atop our distribution center in Phoenix—our first installation in the shape of our iconic logo. Besides producing just under 3,000 megawatt hours of energy each year, its close proximity to Phoenix Sky Harbor International Airport means the bullseye shape can be seen by those flying in from the west. This year, we kicked off our first combined solar and solar powered battery storage project in Kona, Hawaii, in partnership with vendor SunPower. The 910-kilowatt solar system and 250-kilowatt battery will provide over 40 percent of the Kona store’s energy, and capture energy during the day that will power the store’s lights, refrigeration and other essential needs later in the day. This solar-and-storage combo will serve as a case study for the integration of clean, renewable power for other Target locations. By the end of 2017, we plan to complete rooftop panel installations at all six of our stores across the state, which offsets one-third of each building’s energy. In an effort to continue Target’s growth with expanding solar, we added our first rooftop panels in the state of Colorado to a Denver-area store in March. By the end of the year, we’ll have rooftop solar on five of our Colorado stores, which will produce 3,800 megawatt hours of renewable energy annually—enough to power 285 homes for a year. That will offset about one-third of each store’s energy use, contributing to the state’s clean energy goals. Check out our Sustainability pages to learn more about how Target supports the health and sustainability of our communities.